Mojo Monday ~ Time of Change for Lizzie – We Are All Meant to Shine! It was a time of change for Lizzie too, and while these things affected her, it was in a different way. She was just past forty-three years old and still a strong and vigorous woman. 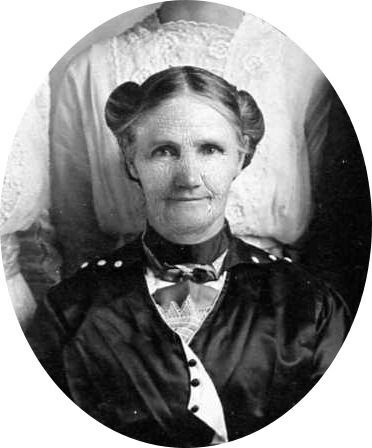 She had fought with William Packard over the irrigation water. Packer insisted that Carlos had given the water right to him, and Lizzie insisted that he was not going to have it. She had used the water to irrigate five acres of wheat and had seen it come to a good harvest under her care. She would stand up for herself, so in the Spring of 1904, when the crop was coming along, she rented out the ranch land as pasture. Then she took the livestock and her six children and moved from the ranch into a house on the Prettyman place down by the river. She stayed here for a few months. Her husband was left in the care of Earnest Wiggett and his wife Mary. They moved back to the ranch and their first son Leslie Wiggett was born there on September 3, 1904. Early in the Spring of 1904 Lizzie decided to leave Burlington. She had a covered wagon to carry a few belongings. She took a horse for Claude to ride and a pony, which Edna rode. They helped to drive the cattle and milk cows, which they also took. Lizzie’s son Carl was also very restless and perhaps hoped for a better start somewhere else or perhaps he felt his mother needed his help during this time. 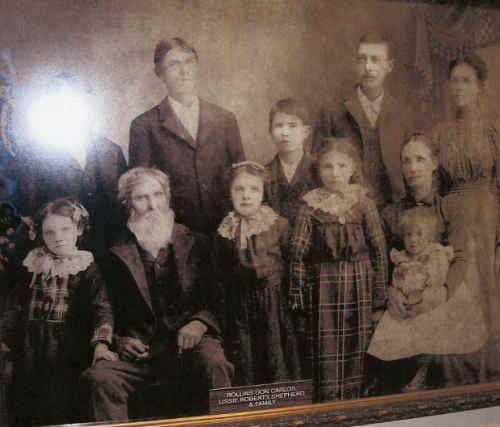 Lizzie, Carl, and Annie with her three young children, left Burlington together. They traveled across Wyoming that summer finding work where they could. Somewhere along Lander, Wyoming the children found lots of wild berries growing along the creeks and river. They picked large quantities of the berries to use fresh and Lizzie and Annie made jelly as well. They moved on southward to Atlantic City, which was a very rough frontier town. They lived in a tent and the wagon that summer. Lizzie sold milk and butter. She baked bread to sell and took in washing from the miners there. Carl and Laffe took a job with their teams cutting and hauling cord wood and railroad ties. The man who leased them the land for cutting did not own the land and they were ordered to get off or be shot. The boys had the wagon loaded but were afraid to drive it out because of the threats. Edna at age twelve was not about to let that load be left there. She climbed up and drove the wagon down to the mill without incident. Once again that summer, Edna kept the family from having trouble. Lizzie had been carefully saving the money she made so she could pay the mortgage on the ranch. She has nearly a thousand dollars and was keeping the money in a large trunk. One evening two very rough men came to buy break and she went to the trunk for change. When they got outside the tent, one man said to the other, “That old lady has plenty of money in that trunk. We will come back after dark and get it.” Edna happened to be standing where she heard them. As soon as they were out of sight she told her mother. Lizzie put the money into two small sacks and pinned them to the inside of Addie and Valie’s clothing. She told the girls if she was caught that they were just to keep on walking. The family went to the home of the Marshall for the night. When they returned to the tent in the morning, the trunk had been kicked open, the contents scattered about and the place torn up, but the money was safe. Lizzie took it to the bank that day and sent it off to Burlington to apply on the mortgage of the ranch. Another story to add here is how Bart, who was not yet five years old, liked to dig through the trash near their tent, which happened to be near a saloon. One day he picked up a round object, but his sister Valie told him it was just an old poker chip and to throw it away. Bart was convinced it was as good as money and sure enough earned one dollar for it. He gave it to his mom to go with the other mortgage money and he liked to tell everyone how he found the last dollar to pay on the ranch mortgage. The family stayed in Atlantic City until the fall of 1904. Carl and Annie’s first child, a daughter names Electra Shepherd was born there on September 20, 1904. Carl gave her the name of his beloved little sister who had died as a child. In the later Fall of that year, Carl and Annie went back to Burlington to the ranch. Earnest helped Carl build a two room house on the upper forty acres. The two young men, with their growing families, lives and worked together on the ranch for about five years. Lizzie moved to Thermopolis, Wyoming that Fall. All the children went to school there that winter. Lizzie’s last child William Gilford Shepherd was born there on December 18, 1904. In the spring of 1905, Bart was ill with large abscesses on his legs. There were no miracle drugs in those days and infections were common. Lizzie could not cure them with home remedies, so she took him to one doctor who wanted to lance them. She was not satisfied with his quick diagnosis and took him to another doctor. He told Lizzie if they were lanced, the boy would never walk again. Lizzie took him home and made homemade poultices of soap and sugar to gather the infection. Finally they broke and drained. Bart was in bed most of that spring. When the family left Thermopolis in the spring, they made a bed in the back of the wagon for Bart. Valie had just completed a most satisfactory full year of school and enjoyed being Bart’s teacher. She taught him to write all the letters and when they ran out of paper they wrote on the side of a wooden box. They had some little “Buster Brown books” they had received when they bought shoes. The read and reread these stories, and also anything that had printed letters written on it. Valie was evidently a successful teacher for when Bart started school he was put right into the third grade where he could read with the best of the class. The family returned to Burlington for a short time that summer, then Claude and Carl took a contract to bale hay on the Y.U. sheep ranch some distance west of Burlington, at a place called Pitchfork. The boys used a baler that was driven by horsed. They hooked the team to the baler, and then the team went around in a circle. The hay was put into the baler which pressed it into the shaped of a bale. A wooden block was dropped into the baler to regulate the length of each bale. Edna and Addie had the job of dropping the blocks between the bales. The bales were then tied with baling wire. They worked long hard hours, and one night Addie, who was very tired, dreamt that they were still working. She shouted out in her sleep, “Block Carl, block! This bale is a mile long now.” They baled a good many tons of hay that season. They piled the bales into long stacks. There were six or eight long stacks of these bales. Lizzie spent several weeks of misery that summer with a big abscess under her arm. She could hardly mix bread or take care of the cooking for the hungry workers. Later that summer the family went to Bear Creek where Lizzie established a little store in part of their home. In the summer of 1906 her son Claude went to Chance, Montana to work on a ranch. It was here that he first met Scott Huffman. Scott was recuperating from lung problems following pneumonia. His family had sent him to the farm of his uncle Onie Hall, to do light work and breath clean air. Claude and Scott became friends. Early in September Laffe took some time off to go on a fishing trip. He went with a fellow named Ross Nixon. (Ross Nixon was married to Rose Clark, who had a sister named Laura Clark. His brother Claude would marry Laura many years later.) Laffe and Ross took the spring wagon and were gone several days. When Laffe returned home he was very sick. He asked Valie and Addie to unhitch the team and take care of them as he was too sick to stand up. He went right to bed and was very ill for many days. He had caught typhoid fever. After a while, he began to feel better. Lizzie decided that the water at Bear Creek was adding to Laffe’s problem, so they packed up and moved down to Belfry, Montana. Laffe did feel better for a while and would sit outside in the sun, but his strength did not return and he continued to feel ill, which gave cause for concern to his mother Lizzie and family. Claude took a job hauling lumber that Fall. In handling the lumber, he got a big half-inch sliver in his thumb that appeared to go nearly to the bone. He tried to ignore it. One night he rode about six miles to visit his girl and when he got home he was in so much pain that he fell off the horse. A doctor came and lanced and drained the wound. Claude nearly had a case of blood poisoning as a result of that incident. Belfry, Montana was a very tine place with neither stores, nor a cemetery. Lizzie had to send Claude and Edna to Red Lodge, a trip or ten or twelve miles up over the mountains, to get a casket. When they got to Red Lodge, the store keeper sold them a coffin and clothing for Laffe to be laid away in. He also included a black veil for Lizzie to wear as was the custom of the day. When they got ready to start back, the stubborn old horse Kate balked as she often did. Claude was just about at the end of his patience. He picked up a 2 x 4 and gave her a beating. This caused the horse to kick wildly and Edna held the reins praying Claude would not be kicked in the head by the flying hooves. Finally the got the mare under control and made the trip back home safely. Lizzie notified the family at Burlington, and they began to prepare Laffe for burial.